Warriors Cup 27: Queens Theatre. Saturday July 9, 2016! Warriors Cup 27 takes place at the Queens Theatre in Flushing Meadow Park, New York on Saturday, July 9, 2016 . Warriors Cup is the East Coast's top Muay Thai promotion, putting on full rules bouts. Last time out, the Queens Theatre was sold out and the card was off the hook. WC 27 promises more of the same, so get your tickets now. Check out the Warriors Cup website for details or call 609-678-6728. Warriors Cup 27: July 9, Queens Theatre! Warriors Cup 26: April 23, Queens Theatre! Warriors Cup 26 comes to New York on Saturday April 23, 2016 at the famed Queens Theatre in Flushing Meadow Park. Warriors Cup is the premier Muay Thai promotion on the East Coast, and every card is chock full of the best talent anywhere. Saturday's show feature multiple title fights and a stacked undercard. For ticket info call 609-678-6728. And checkout the Warriors Cup Facebook page as well. See you at the fights! On December 4th, Carl Mascarenhas will be inducted as Amateur MMA Promoter. Carl is the trainer of multiple MMA ,Kickboxing ,Boxing Pro and Ammy Fighters. He is a World Cup Gold Medalist in Kickboxing (WAKO) 1995 and a 1995-1999 4 x US National Kickboxing Champion. Carl is also the creator of the Asylum Fight League and has promoted over 600 Pro/Amateur Fights. Now promoting Asylum 49 in November. Started New Breed Fighters in 2006 Then Refined the system of event planning and Match Making which led to opening ASYLUM FIGHT LEAGUE in 2008. Currently Owner of Primal Kickboxing in Berlin NJ .1999-2008 Carl Has Been a Consultant for United Professionals traveling throughout the country and even overseas teaching school and gym owners how to grow their business in the Martial arts and make a great living while elevating teaching methods. A Father of a great son CJ, whom works side by side with him to give fighters a helping hand to get to the next level of Competition. Dead Serious MMA is back with their first show of 2015. 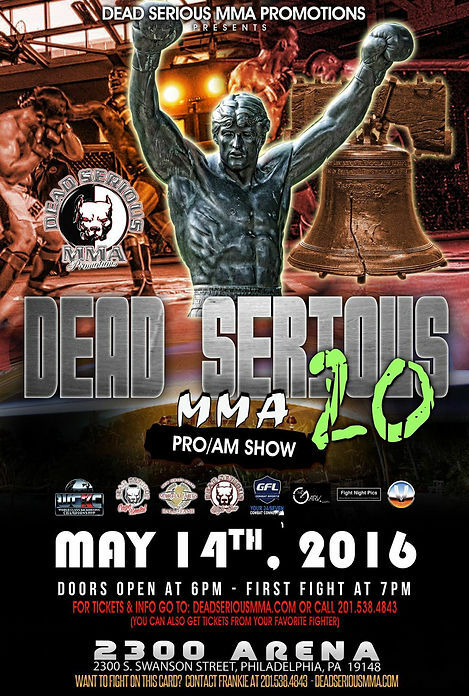 This Saturday, March 7, at the Rahway Rec Center in Rahway, New Jersey, Dead Serious will once again showcase some of the finest mixed martial arts talent in the USA. For ticket info, check out the Dead Serious MMA wesbite. And don't forget to order up some of the finest MMA apparel in the world at Dead Serious Fight Gear. Frankie Perez is something special. Even when he was an amatuer mixed martial artist, people who watched him fight knew that he would one day fight for the biggest MMA organization in the world, the UFC. And now, after a 9-1 pro career, with his lone loss being a very close split decision against Chris Wade, Frankie makes his UFC debut tomorrow night on the undercard of the McGregor vs. Siver fight. I've been lucky enough to see just about every one of Frankie's fights, and I've been saying for a long time that he is a world class fighter. Now he's going to get to showcase his skills to a worldwide audience. Frankie is the real deal, and I really look forward to him fighting the best fighters in the world. The UFC Lightweight division is on notice: Franke Perez Jr. has arrived!